The Foot Mechs, also known as Foot Gunners orFoot Gunner Ninja, were robots created by Baxter Stockman for the Foot Clan in the 2003 TV series. The Foot Mechs were based on the Utrom exosuits and had advanced weaponry, but because they were formed around a rare Utrom biochip, only nine were recovered, including replications of the President of the United States, the Prime Minister of England andSplinter. The Splinter Mech was sent to infiltrate theTurtles’ base and destroy them from within, but was ultimately found out and destroyed by Zog. Eventually, all the Foot Mechs were destroyed by the Turtles. Foot Gunner Ninja was a boss in the console/PC versions of the 2003 video game. The Foot Mechs appear in the game Teenage Mutant Ninja Turtles 2: Battle Nexus. The Foot Mechs were seen in a few levels on the Utrom Shredder’s ocean liner. When they were destroyed by a player they could still do a lot of damage when they explode. They were good shooters in the game but lacked many of the things they did in the series. Foot Mechs could shoot once but when attacked they would shoot three laser blasts at once. In the GBA version they would appear in the T.C.R.I. building. In the series the Utrom Shredder created nine but in the game there were many more than that. Foot Gunner Ninja from the first TMNT game had a large shield, had missiles to throw at a player, and could shoot out large flames of fire. Foot Gunner Ninja was only seen in one level but made a second appearance in the Challenge Mode level. Foot Gunner Ninja is not in the series at all but his design is similar to the Foot Mechs. Foot Gunner Ninja walked slow so it was easy for him to lose sight were his enemy went. The Foot Mechs in the series were pretty tough. In the series they could throw out a chain and bring a person close to them so they could cut them with a saw that came from their stomach area. 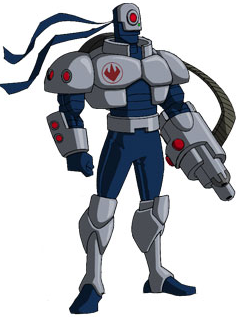 The Foot Mechs made another appearance in the 2003 show in season three episode Exodus, Part 1 in the introduction sequence, while they would make one last appearance in the season four episode Bad Day when the Utrom Shredder gathers up most of the Ninja Turtles enemies. The Foot Mech version of Master Splinter first battled the Turtles in the series but was defeated by Zog. Foot Mech Splinter was in the video game but had more tricks up his sleeves. Foot Mech Splinter had a shield, lasers and could move at an incredible speed. In the game Foot Mech Splinter also appeared in the Battle NexusTournament in the Foot Fight Mode along with other Foot Clan Members.